Passionate about our service, music, entertainment and most importantly, delivering you a quality wedding disco. Please read some of our testimonials on this page and see for yourself genuine feedback left for us on our Facebook page. We are more than happy to come and visit you to discuss your exact requirements for your wedding disco. Your thoughts and our specialist touch will prevail for a great night ahead. We can also advise on that all important wedding song if you don’t already have one to mind! We won’t charge any extra to come and visit you. We can help you choose your desired music genres to match the atmospheres of your choice. You may wish to start with some mellow soul or jazz whilst your guests arrive or you may wish to end the night with you and close friends favourite 80’s disco error. We can discuss your exact requirements for the night. However, if it all sounds a little too complicated as there are plenty of other responsibilities to think about on the day and night, then simply leave the music decisions to us if that suits you best. We hate being late! So tell us where to meet you and when at your reception location and we will see you there! Then after a brief chat, leave the entire setup to us. We need no help and won’t bother you unnecessarily. We will also arrange collection with the location provider for a convenient time. Most wedding venues now insist that third party services have their own insurance. 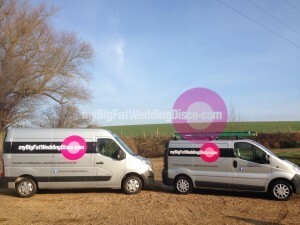 Accidents are extremely rare but for your peace of mind, myBigFatWeddingDisco.com does operate with a full, valid Public Liability Insurance and all our electrical equipment is PAT tested in accordance with regulations. There is much to read and take in whilst searching the web for your preferred wedding disco, but below is a quick summary of our services to speed things up for you. We do require a deposit of £100 per booking. The remaining balance can be settled later or on the day. Lastly, we will provide you and your guests a great nights entertainment!